The latest patch, 2.4, put in a code that makes premade groups wait for other premades. I do not disagree with this theory. The hardest fights are actually the most fun for me. However, the implementation was not so smooth. 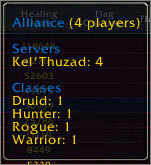 Currently a premade group is waiting 45 minutes to an hour to face another premade. Corpses, corpses everywhere and not an Ally to kill. Oh wait! The bear! Why wait 45 minutes to kill Alliance in a BG when you can go to the Isle of Quel’Dalas and kill them now? Well, personally I like killing people who want to PVP rather than random victim bastards, but we had to take out our angst somewhere. Some great changes for PVP and for fishing! Have a look. Fishing is below the fold. – Diminishing returns on honor for kills is being eliminated. - Honor will now be instantly calculated, and available for player use. 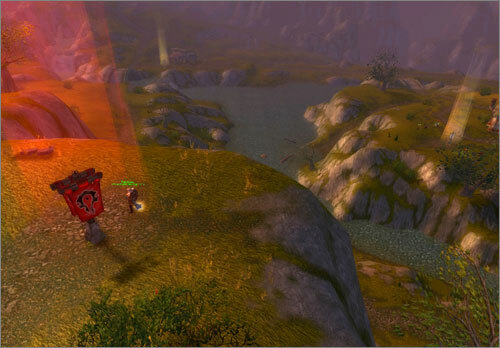 – Added new PvP daily quests that send players to Halaa and the Spirit Towers of the Bone Wastes. These quests are available for Alliance and Horde at their respective local quest hubs. above his or her team’s rating is now limited. mana regeneration will come into effect. – Queue times for arena matches have been reduced. Players will now be able to enter matches faster than previously. - Shadow Sight now increases damage taken by 5% rather than dealing damage over time. Duration has been reduced from 21 seconds to 15 seconds. longer be worth honor for the remainder of that battle. once the battleground is complete have been removed. water elemental cannot be banished, and does increased damage. maximum health and damage by 25%. This is a stacking effect. - There is now a Join as Party option. - When both flags are held, the flag carriers will receive 50% increased damage done to them after approximately 10 minutes and 100% increased damage after approximately 15 minutes. OK thanks to the help of some folks at The Safehouse, I’ve figured out some bugs in the system and our forums are now official. Post to your heart’s content. Just keep in mind if you’re registering a new account that I have to approve it before anyone posts anything. Since I work it might take a while. So have fun posting this Tuesday! We had a rather impressive performance for the few games we played Saturday. Y’all killed tons of people! We also won pretty quickly too, with Kinare and Aahz running flags. FYI My old car died, so I’ve been doing a lot of research to get a new (to me) one. My apologies for not being online very much. Welcome Bleeder as a new officer! Ever since he joined the guild, Bleeder has really been about one thing: PVP. He’s been a leader for a while so it’s only fitting that he have the title to boot. Thanks man! Now you’re an officer. I’m not sure what that means, other than you get officer chat (which we rarely use by the way unless we’re booting someone because they’re annoying). Notice LM under control and two more nodes under assault. We 5-capped that game. First off, thanks to Bleeder for organizing this shindig! EDIT: Read Bleeder’s awards for WSG including damage/heals/KBs. When I got home from work, there were two spots left in the Warsong, so me and Stomples joined up, making it a full premade. During the time I was there, we only lost one game to a full, very geared, KT premade. But the next time we fought the team, we took the flag and protected it well, for we knew if we did well enough, they would give up. Bwak bwak bwak (chicken noise). Thanks Bleeder for taking up the torch on this one! He wants to start getting some PVP on for Wednesday nights. I thought I’d give you a day’s notice. 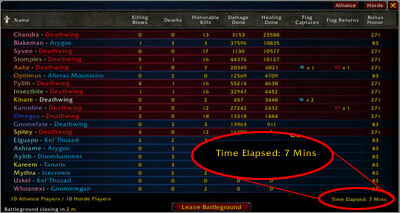 A full premade can win a WSG in about 15 minutes. It’s good, quick honor if we can get enough people. Even with 5-6 we can have quite an affect in a BG that is 10 v 10. Thanks for stepping up Bleeder! 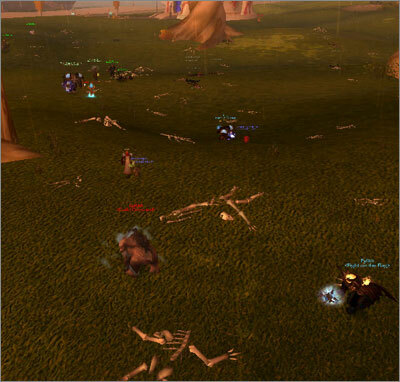 We got bored and decided to try some world PVP. 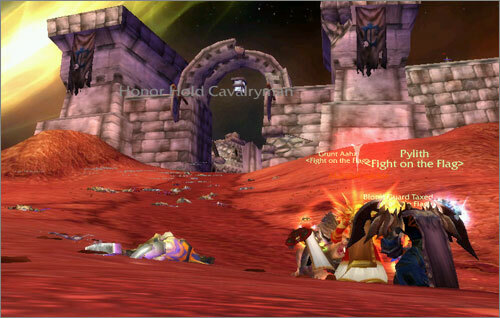 We’d never really done that as a guild before except for Halaa. Halaa was ours so we headed to Honor hold. AV weekend is coming up so please have Preform AV enabler downloaded and ready to go. Step 1: Install and enable Preform AV enabler. Step 2: Group with a guild group. Step 3: Profi… er… Go talk to the AV battlemaster and sit there with the window open. You’ll notice to the bottom left of the window that there’s a button that says “Preform AV enabler.” If you click that, you can tell who has the window open or not. Step 4: Wait. The raid leader should wait until everyone has the window open. The leader then pushes a button to queue everyone at the same time. Now, despite what people in general chat say (because we know they are all such experts), it’s not an illegal mod. Preform AV enabler is basically the same thing as everyone having the window open, and counting down on Vent and queueing at the same time. Step 5: DO NOT CLICK ANYTHING! The raid leader has the ability to put everyone in the BG or to cancel queue. It’s also a good idea not to run off anywhere just in case you have to requeue. Remain in Vent. Hopefully the queues are not long. I said I’d never do forums. I was wrong. But if the forums are abused in any way, they’ll be taken away. This is a beta version. Please help me test bugs and such. When I’m satisfied there will be a perma link here on the Web site. Feel free to post suggestions on forum titles, catagories and user titles. I am incredibly new to phBB forums so please bear with me.